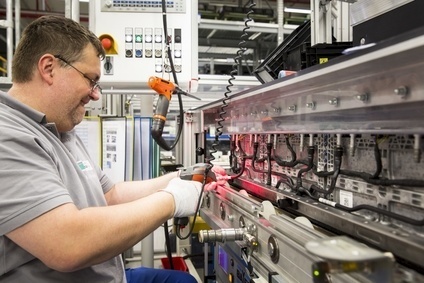 Daimler is expanding production capacity for lithium-ion batteries and plans to spend another EUR100m on its Deutsche ACCUmotive subsidiary which supplies lithium-ion batteries for the current Smart Fortwo electric drive and the hybrid Mercedes S-, E- and C-Class. It has delivered over 50,000 battery packs to date. "Deutsche ACCUmotive will be producing the lithium-ion batteries for the upcoming electric versions of the Smart Fortwo and Forfour from 2016 as well as for future hybrid models of Mercedes-Benz", said MD Frank Blome during the topping out ceremony for a new production hall. With the completion of the third construction phase Deutsche ACCUmotive will have nearly 20,000 sq m of production and logistics space or four times the area since the start of production in 2011. "The development and production of our lithium-ion batteries is competitive in every respect. We are in the black," added Blome. Deutsche ACCUmotive was founded in 2009 for the development and production of lithium-Ion battery systems for vehicles and is a wholly-owned subsidiary of Daimler AG. Research and development activities are in Nabern in the Stuttgart area and production is in the Saxon city of Kamenz. Series production started in the year 2011. The subsidiary employs around 250 employees – 180 in Kamenz and 80 in Nabern. Current output includes three battery systems for different Daimler group models.